Picture your child with the focus, confidence and inner-peace of a Kung Fu Black Belt…..
Cultivate “inner-confidence” that shows itself through a respectful attitude towards you, teachers and even other friends. This skill set is unfortunately becoming more and more rare. In our age of video games, MTV, fast food and skyrocketing obesity levels in kids, the simple life skills of self-discipline, respect and courtesy have been trampled upon. Your children are not learning this skill set in the public schools, and certainly not on television or through video games. 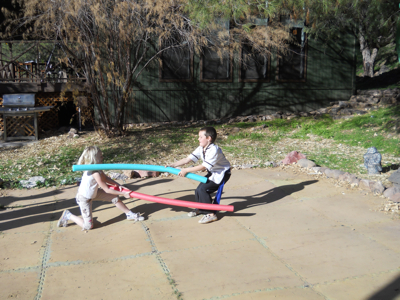 So – how can your child develop extraordinary strength, confidence, focus, respect and courtesy? My name is Jason Campbell. 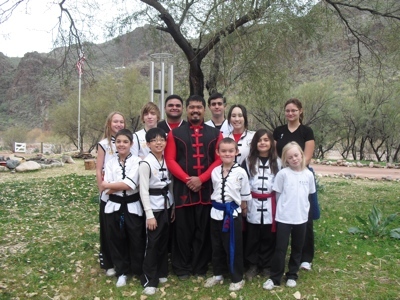 I am the co-owner of some of the most successful martial arts schools in the United States – United Martial Arts here in Phoenix. 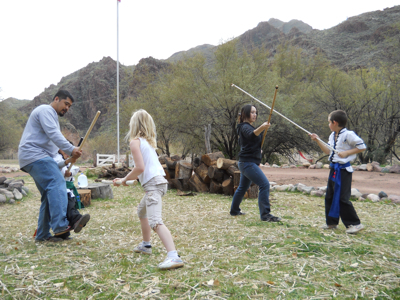 For over 20 years, we’ve been training children like yours with character building tools found only in Kung Fu. 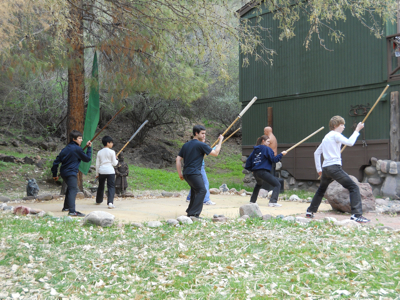 No other sport or activity can match the life skills learned in Kung Fu. I invite you to experience a complimentary orientation lesson where you will see first hand the life skill and confidence your child will develop in our program. Below are testimonials from family’s that train at our school. and a short description I wrote about our program, the training and philosophy. “Since my daughter started Masters Path training at UMA she is more confident (not that shy), she is able to pay more attention while doing her homework (focus), and most important self-control. “A personal victory for me was when I got my Green Belt. I feel more patient, especially in the class. 5-Day Training Camp held on the Northshore of Kauai, HI. Click here for dates. Confidence does not come from telling a child how great he is. That is certainly better than telling him the opposite, but mere praise will not develop a high level of self-esteem. Confidence comes from setting a goal, breaking through the necessary obstacles to achieve the goal, and then being acknowledged for their accomplishments. Please deeply consider that statement. I see many parents “baby” and “smother” their kids (out of love, of course.) Their intention is good, but it usually makes the kid weak and soft. I do not mean that that you have to be “harsh” with a child for him to grow. I do mean that all children need to be challenged beyond their comfort zone in order to actualize their potential. Kids will grow only as much as they are challenged to grow. Our programs at United Martial Arts are designed to challenge students beyond their comfort zone in a clean, safe environment. For example: Your child will clearly see a target (goal) in his mind and each day work towards that target. Yet at the same time, he or she learns to stay completely present in “this moment.” When you experience “presence” your senses become enhanced. You hear everything, you see details around you, you feel your inner body in a way that you did not know exists. The mind then becomes sharper, clearer and more focused – instead of clouded, scattered and busy. Over time, this training will develop a very high level of confidence and self-assuredness. The inner-peace that comes with this type of confidence does not make a student “cocky”. The inner-peace gained has the opposite effect – total confidence without the need to “show off.” This is one of many lessons learned in our training program at United Martial Arts. This might seem “deep” or “heavy” for a kid to learn. In my experience, kids are very capable of learning this. They might not be able to put it into words, but 20 years of teaching full time has taught me that most kids are not stretched to their full potential. Many years ago I dedicated my life to bringing out the best in others. The word HUMAN-BEING is broken into 2 parts. The “being” in you does not change. The “being” part of you is the same from when you were born. Think about this. You are the same “you” as you were as a child. The “human” part of you is very different from when you were a child. This is always changing. Earning a United Martial Arts Black Belt trains both the “human” and the “being”. The “human” is developing life skills. Focus, discipline, self-esteem, respect for self and others are all part of the training. For a student to learn this at an early age gives him or her an advantage in life. This is not taught in schools. Often, the opposite is taught in schools. This is a simple yet powerful teaching from Lao Tzu. It points to the same thing I said above. The teaching is to set a positive long-term, life-changing goal, then come back to this moment and stay fiercely present. Below is a bit technical, but really, really, good information. Learn these mechanics of the body and your energy level will increase. If you child learns this (and she will during the training,) she will have an incredible advantage in life. But, if your eyes start to “glaze over”, just skip this paragraph and read it later. By staying present, your child will become stronger in mind, body and spirit. Chinese and Taoist medicine is based what is called the 5-Element theory. You have the “battery” of your body, located under your navel in the center of your stomach, just below your large and small intestine. For vital health, you must “charge your battery” – this is done through correct chi gong breathing and the kung fu forms. Poor battery = sickness and disease. Period. End of story. Show me an unhealthy person and I will show you a weak battery. I believe the stock of the pharmaceutical companies would plummet if this simple concept of charging the battery on the body was taught to school children. No, we can’t reach all school children, but we can reach yours. It is far more difficult for sickness to thrive inside a body that has a properly charged battery. It is much wiser to prevent sickness before it happens. You have 8 “reservoirs” that regulate the energy (chi) flow through out your body. You also have 12 “energy highways” that are each connected to one of your 12 organs. Your level of health and vitality will be in direct proportion to your organ health and your circulation of energy. Poor health also occurs when the energy gets “blocked” from traveling freely along your “highways”. The 9 major blockage points are the ankles, knees, hips, low back, mid back, neck, shoulders, elbows and wrists. This is of course impossible to fully explain in a short letter – students spend 4 years in medical (acupuncture) school to learn this. It is always wise to model those you want to be like. We teach how to defend against the negative forces in your child’s life (such as peer pressure, lack of focus, lack of confidence, etc.) Give your children the opportunity to develop an inner strength that will defend against outside bad influence. As you know, time goes by like a flash of light. Whether your child spends their time training and focused on a goal or sitting on the couch eating cheesey puffs, the time will come when he is a few years older than he is now. What would you like your child to show for that time? If I could clone him, one earns a black belt and his clone makes all the reasonable excuses not to train (yet has the time to become highly skilled in video games), who would you rather have in your household? This is of course a silly question. I say this because I have heard all the excuses why parents can’t support their kids and help them commit to a path of personal growth. These kids usually do not learn the skills of discipline and focus, because the parents do not posses a high level of those skills. You can only give what you have an abundance of. The literal translation of Kung Fu is energy and time. This means it will take time and energy to become highly skilled in a craft. We all have 168 hour in a week. The wise and deliberate parent will take the time to design their child’s education. Do not let it happen “by accident”. Many kids and families with “no time” tend to still have “time” to become “black belts in video games” and watch hours of TV every week. Be disciplined by focusing on priorities and teach your kids to do the same. If you have a “hectic household” then you really need to get your child training for a black belt. Actually, you should consider it to, but that is another story. Whether it is Kung Fu, Tai Chi, Zen Yoga or Medical Chi gong is not important. Any one of these modalities will do. The fruit falls not far from the tree. Your kids are learning your habits, both good and bad. Change yourself to change them. The bottom line is that if you are reading this and if you have made it this far into my letter to you, you are inspired. Inspired not only to see your child grow, learn and develop, but hopefully for you as well. Be inspired to support your child in his quest for Black Belt. Not just because of what he gets to “do”, but because of who he gets to “become”. We are not human “do-ings”, we are human “be-ings”. Imagine how good you will feel knowing that your child is on a path of self-mastery and inner peace, while being focused on specific, measurable goals. And of course, she will learn skills to handle herself in a physical confrontation. It is better to have self-defense skills and never need them than to need them and not have them. 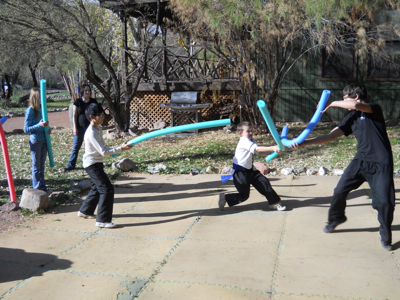 Complimentary lessons at our Kung Fu School (with no strings attached.) See for yourself if, in fact, we can give your child the powerful benefits promised in this letter. During this lesson your child will have an opportunity to build a closer relationship with the instructor and we will have an opportunity to answer any and all questions that you may have about our program. Before or during the introductory program we will meet with you-one-on one to discuss your child’s needs and your child’s progress. 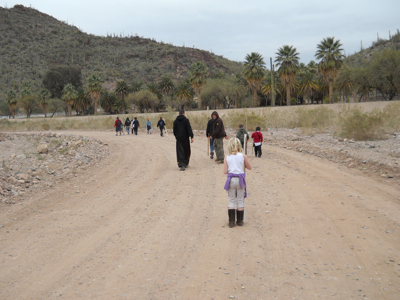 We will discuss our program and help you understand the developmental process for your child. We will give you tips on how to reinforce your child’s development and share with you his or her progress. Watch with your own eyes as your child gets coached by a top kung fu teacher. Class One at the United Martial Arts school. 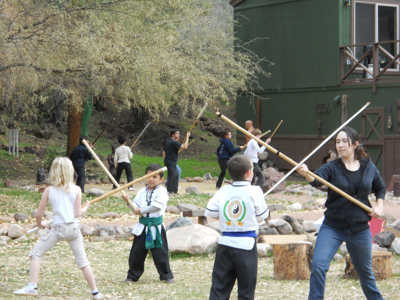 Your child begins by learning the profound influence of the martial arts. Watch as he warms to the idea of emotional respect, for both himself and others. See her gain power from the ability to be confident yet respectful. Pick up the phone and call 623-535-5517. We’ll answer any additional questions that you may have and schedule a special time with our head instructor to work with you and your child. Fill out the form above to register for your complimentary lesson. You will get a call from a United Martial Arts representative within 24 hours to schedule your first lesson. Please act quickly because these classes fill up fast – and, we are committed to giving our students individual attention in all our classes. Whatever you do, I urge you to register today. Call or fill out the form below. Call as soon as possible. Our programs FILL-UP FAST. Register Early and insure your spot. It is consistently stressed to all students that kung fu skills require them never to be abusive or offensive and are only for use defensively. After a short period of time students become markedly less aggressive while maintaining confidence and high personal self-esteem. Thank you for your time and I look forward to meeting you at one of my schools. Be assured, we do teach kung fu as everyone likes to think of it. Your child will end up knowing how to protect herself. She’ll know how to avoid danger, how to use conflict resolution techniques – but without once throwing a kick, block or punch. Of course, if she needs to defend herself physically, she will be prepared mentally and physically to do the right thing. As you think, you become. Think of yourself strong, focused and inspired, with a black belt around your lean waist. Picture yourself as you wish to be. Do not waste precious thoughts on negativity or focusing on what could go wrong. Worry is just the recurring thought pattern of what could or has gone wrong. It is a form of insanity. Discipline your thoughts and you can create the reality of your choosing. Master this skill – then teach it your kids. Every thing happens in the now. 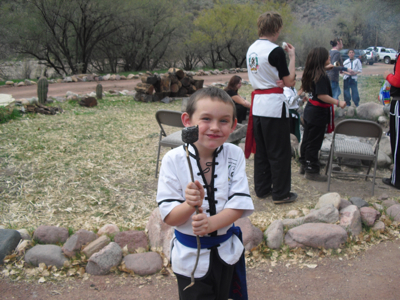 Your child begins his training at United Martial Arts “in the now” and become a black belt “in the now”. From that viewpoint, everything happens “in the now” and not in what we think of as “clock time”. The seeds of success (or failure) are first planted in the mind, then grow into reality. Deeply consider that point. Register now to insure a place in this program. Call 623-535-5517 right now to schedule your private introductory time. There is no obligation or charge for this introductory program. Even if you choose not to continue with us – we’ll even give you alternative ideas for your child – and, even recommend another program if there is a program more appropriate for your needs. 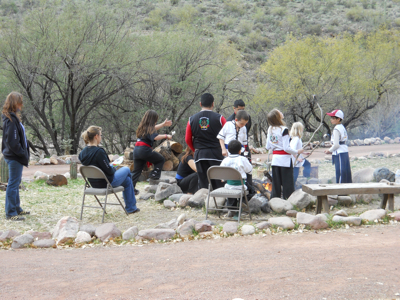 [divider top=”0″] Below are pictures from our Kids Kung Fu Camp. 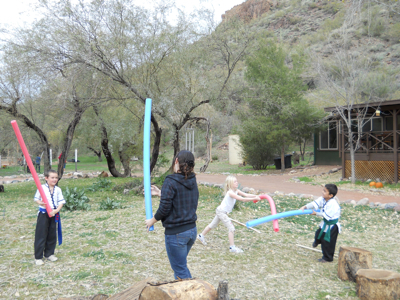 The focus of this 2-day camp was on Wind Staff Training. Click here for more information on the next Leadership Camp. 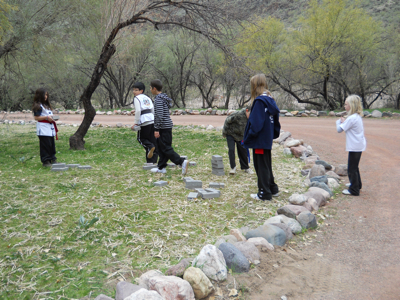 The kids on their first day at Kung Fu Camp with Chief Instructor Venable and Assistant Instructor Demarbiex. 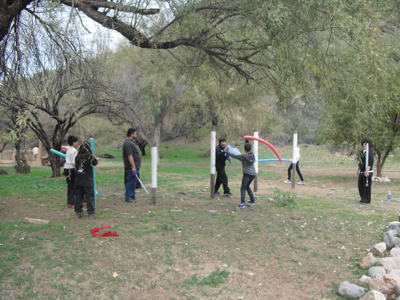 Staff training – the kids were divided into groups and practiced their staff training, round robin style. 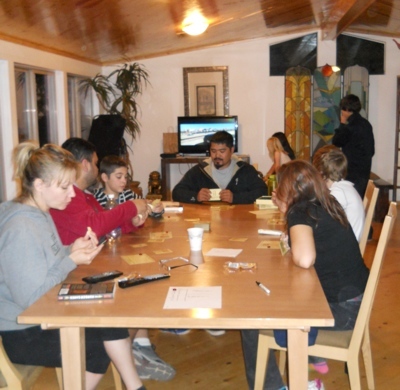 Evening festivities included card games and kung fu movies. 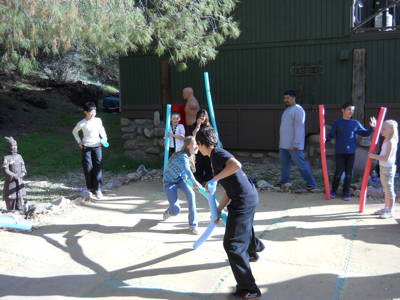 Practicing their skills with floppy pool noodles – too much fun. Marshmallows – a yummy treat after a day of hard training. The joy of roasted marshmallows. 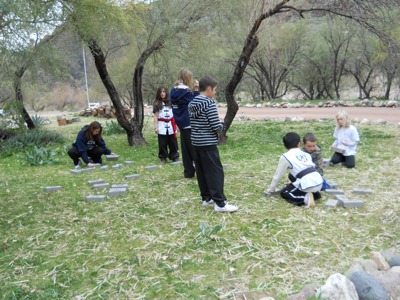 Playing “king of the mountain” with bagua posts, bricks and floppy noodles, training balance and coordination. 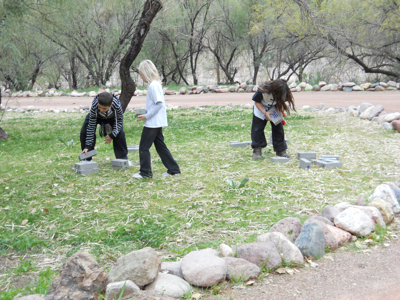 Placing bagua bricks for training. Setting up the training area. 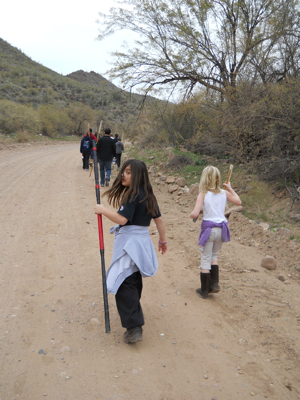 The whole group pitches in to help. The youngest of the Little Lions in beginning staff training. Continued training with the staff, more advanced group. Chief Instructor Venable continues the training of the Little Lions. 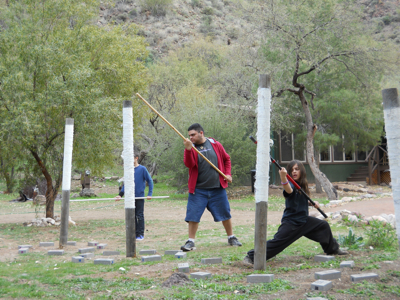 Staff training at the bagua posts.